The advances on multimedia systems have brought new challenges and requirements for media sync. Over the years, many media sync solutions have been devised. Due to this variety, several studies have surveyed the existing solutions and proposed classification schemes or reference models for media sync. This paper claims the relevance of media sync reference models to systematically structure and synthesize this research area. Accordingly, a review of the existing reference models is provided, by examining the involved features, components and layers in each one of them. Likewise, some inconsistencies, open issues and missing components in existing reference models have been identified. Accordingly, this study reflects the need for a new modular and extensible theoretical framework or reference model to efficiently comprehend the overall media sync research area. Montagud Climent, M.A, Jansen, A.J, Cesar Garcia, P.S, & Boronat, F. (2015). 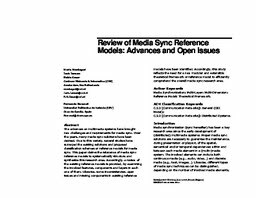 Review of Media Sync Reference Models: Advances and Open Issues. In M.A Montagud Climent, P.S Cesar Garcia, F Boronat, & H.M Stokking (Eds.), . MediaSync2015 Workshop.